The Italian Renaissance of the 13th and 14th centuries spread through the rest of Europe, representing a time when Europe sought knowledge from the ancient world and moved out of the Dark Ages. A renewed interest in science and experimentation, and a focus on the importance of living well in the present as opposed to the afterlife as promoted by the Church. The Renaissance brought on an explosion in art, poetry, and architecture. New techniques and styles developed as these art forms moved away from the colder and darker styles of the Middle Ages. This period, in this view, represents Europe emerging from a long period of backwardness and the rise of trade and exploration. The Italian Renaissance is often labeled as the beginning of the "modern" epoch. However, it is important to recognize the countless modern institutions that did have their roots in the Middle Ages, such as nation-states, parliaments, limited government, bureaucracies, and regulation of goods and services. In the wake of the Black Death, which decreased in incidence in 1351, faith in the power and significance of the church declined. The multitude of deaths (approximately 25-30 million between 1347 and 1351) signaled the need for a revival in art, education, and society in general. A large decrease in workers led to demands for higher wages, and thus uprisings were staged in several countries throughout Europe, particularly Germany, France, and Italy. The Renaissance began in northern Italy in the early 1300s. Although it was not inevitable, several factors—nationalism (due to an increased pride in the days of early Rome), the Crusades, revival of trade—helped to bring about reform. Throughout Italy (Florence, Genoa, Rome, Naples, and Milan in particular) scholars revived their studies of early Greek and Latin literature, derived from archived manuscripts. Upon examining these early works, they realized that culture was essential to living a meaningful life, and education (especially history) was important in understanding both the world of yesterday and contemporary times, as well as gaining insight into the future. Thus, Italian scholars called for a 'Renaissance' (French for rebirth) in European education and culture. The denizens of Florence fell into one of four main social classes. These included the grandi (the great), the rulers of the city; the popolo grosso (big people), the capitalist merchants (these challenged the grandi for power); the smaller businesspeople, and the popolo minuto (little people), the lower economic classes, such as the paupers, who, despite constituting a third of the Florentine population, had no wealth at all. This division of society was prone to conflict, and eventually resulted in the successful Ciompi Revolt of 1378. The Ciompi Revolt was that of the poor, who revolted because of the constant feuds between the grandi and the popolo grosso, the anarchy from the Black Death, and the collapse of banks, which made the popolo minuto even poorer. After a while, the Ciompi Revolt led to a four-year reign by the popolo minuto until Cosimo de’ Medici came into power in 1434 and restored the stability of Florence. The plague resulted in more favorable working positions for women, although the overall participation of women in public life varied with class as well as region. Married couples worked together frequently, and most men and women remarried quickly if their spouse died. At the beginning of the Renaissance, the boundary between the poor and criminals was very thin. Larger cities frequently had problems with organized gangs. The so-called "decent society" treated the marginal elements of society with great suspicion and hatred. Women were featured prominently in the underclass, and many poor women found prostitution their only option. The Hundred Years' War resulted in the various governments in Europe borrowing a great deal of money that they could not pay back. Thus, merchants were less likely to take risks, and instead invested in government bonds. The result of this was an overall decrease in trade. Pico della Mirandola, 1463-1494, one of the most famous humanists of the Renaissance. By an unknown artist, in the Uffizi, Florence. At the time, Italy was the center of culture in Europe. Middle class writers were supported by noble patronage, and as a result, during the beginning of the Renaissance literature blossomed alongside classic revival. This resulted in the rise of humanism, an intellectual movement that advocated the study of history and literature as the chief means of identifying with the glories of the ancient world. Humanism advocated classical learning and active participation of the individual in civic affairs. Renaissance scholars advocated the concept of "returning to the sources," attempting to reconcile the disciplines of the Christian faith with ancient learning. In addition, the concept of civic humanism arose, which advocated participation in government. Civilization was inspired by the writings of Roman emperors, and by the end of the 1400s intellectuals had a command of the Latin language. In the 1440s, Johannes Gutenberg created a printing press with movable type. This revolution in communication greatly assisted in the spread of Renaissance ideals throughout Europe, allowing the ideas to be printed for mass circulation, for the first time in history. Gutenberg was the first European ever to create a printing press with a movable type, though the Chinese had long before innovated this technology. The Renaissance conception of life and man's role on earth was more secular than in the past, but in no way was it nonreligious. It was now believed that God holds people above everything else, and that the greatest thing about being human is the human's free will to choose. People were celebrated, as Renaissance scholars argued that men are made in God's image, and that we should celebrate our God-given talents and abilities. People believed that life on Earth was intrinsically valuable, and that citizens should strive to be the best that they can. The emphasis of the Renaissance was on the individual rather than the collective. Francesco Petrarch (1304–1374) was an Italian scholar, poet, and early humanist. In his sonnets, he created the image of real people with personality, debunking the typical Medieval conceptions and stereotypes of people. Giovanni Boccaccio (1313–1375) wrote The Decameron, a short story about the lives of people living during the Black Death. The book focused on people's responses to the plague rather than God's wrath. In this sense, the book was not about religion, but rather about people, a relatively new concept at the time. Pico della Mirandola (1463–1494) was an Italian Renaissance humanist philosopher and scholar. He authored the "Oration on the Dignity of Man," which has become known as the "Manifesto of the Renaissance." In this, he explained that man has unlimited potential, and with his free will can be anything he wants to be. He argued that man should make use of his abilities and not waste them. Finally, he explained that people should live their life with virtue, or the quality of being a man - shaping their own destiny, using all of their opportunities, and working aggressively through life. Sir Thomas More was an English lawyer, writer, and politician. He was a devout Catholic who wrote Utopia, a novel that depicted Christian Humanist ideals producing an ideal fictional society. In his utopia, there was no crime, poverty, nor war. Much of the novel is a conversation that criticizes European practices, especially capital punishment. Desiderius Erasmus was a Dutch humanist and theologian. He was also a Catholic. In his Handbook of a Christian Knight, he argued that through education, society can be reformed in the pious Christian model. He believed faith, good works, and charity were the core Christian values, and that elaborate ceremonies were superfluous. In his The Praise of Folly, Erasmus claimed that the true Christian table of virtues, namely modesty, humility, and simplicity, had been replaced by a different, perverted value system of opulence, power, wealth, and so on. Renaissance art tended to focus on the human body with accurate proportions, and the most common subjects of art were religion, mythology, portraits, and the use of classical (Greco-Roman) subjects. Artisans of the Renaissance used oil paint to add shadow and light, and the use of the vanishing point in art became prominent during this time. Artists of the Renaissance depended on patronage, or financial support from the wealthy. Leonardo da Vinci of Florence was known as one of the great masters of the High Renaissance, as a result of his innovations in both art and science. Leonardo is often viewed as the archetype of the "Renaissance Man" or "polymath" because of his expertise and interest in many different areas, including art, science, music, mechanics, architecture and the arts of war and philosophy. Leonardo is best known for his paintings, the most famous of which are The Last Supper and The Mona Lisa. There remain about fifteen paintings attributed reliably to Leonardo, and many others to his pupils and imitators. 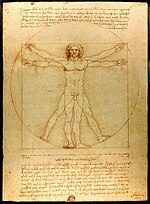 He also left several important drawings of which the "Vitruvian Man" is the most famous and probably the most reproduced drawing in the world. Leonardo left many note books of studies of many subjects, often profusely illustrated. Much of his work was intended for publication but only a small percentage of his work was published, relating to art and mathematics. In science, Leonardo practised meticulous observation and documentation. He dissected thirty corpses in order to study human anatomy and produced detailed drawings of the human skeletal, muscular, and internal organ systems including human fetuses. He made discoveries in anatomy, meteorology and geology, hydraulics, and aerodynamics. This led to his devising of many ingenious plans, including an underwater diving suit and non-functioning flying machines. He also sketched plans for elaborate killing machines. Many of these projects have proved impossible to create. On the other hand, he successfully built a mechanical lion that walked, roared and opened its chest to produce a bunch of flowers. Michelangelo's David statue, in Florence. Note that the original is kept at the Accademia in Florence. The statue in the Piazza della Signoria is a copy. Michelangelo was one of the most prominent and important artists of the Renaissance, supported by the Medici family of Florence. Michelangelo's monumental sculpture of David preparing to kill the giant Goliath with his rock and sling is the perfect confirmation of the return to a humanistic appreciation of physical beauty from the austere medieval conception of emaciated, self-flagellated saints. Michelangelo also adorned the ceiling of the Vatican's Sistine Chapel with his "Creation of Adam" and other scenes and painted the Last Judgment on one wall of the Sistine Chapel in present day Vatican City. Raphael was a famous painter and architect during the Renaissance. Some of Raphael's famous paintings include The School Of Athens, The Nymph Galatea, and Portrait of Pope Leo X with two Cardinals. The Prince, a political treatise by the Florentine writer Niccolò Machiavelli (1464–1527), was an essential work of the Renaissance. For the first time, politics was presented as an objective science. Machiavelli recorded successful rulers and then drew conclusions without judgments. In other words, Machiavelli's politics were divorced from morality and religion. The Southern Renaissance in Italy occurred earlier, from about 1300 to 1600, while the Northern Renaissance occurred later, ending in about 1630. The Southern Renaissance emphasized pagan and Greco-Roman ideals, and as a result was considerably more secular, while the Northern Renaissance advocated "Christian" humanism, or humility, tolerance, focus on the individual, and the importance of earnest life on earth. While the Southern Renaissance emphasized art and culture, the Northern Renaissance emphasized the sciences and new technology. This failed to occur in the south primarily because the Roman Catholic Church stunted learning and the sciences. While the Northern Renaissance was religiously diverse, with the rise of Protestantism and a great deal of religious division, the Southern Renaissance was entirely Roman Catholic. The Southern Renaissance saw far fewer universities, while the Northern Renaissance saw more universities and education. Also, Northern Renaissance humanists pushed for social reform based on Christian ideals. With the Renaissance came the rise of new monarchs. These new monarchs were kings who took responsibility for the welfare of all of society. They centralized power and consolidated authority - the kings now controlled tariffs, taxes, the army, many aspects of religion, and the laws and judiciary. In the way of the rise of new monarchs stood the church and nobles, who feared losing their power to the king. In addition, these new monarchs needed money, and they needed to establish a competent military rather than mercenaries. The middle class allied themselves with the new monarchs. The monarchs desired their support because their money came from trade, and this trade provided a great source of taxable revenue. The middle class supported the monarchs because they received the elimination of local tariffs, as well as peace and stability. From the tenth century onwards France had been governed by the Capetian dynasty. Although the family ruled over what might be, in theory, considered the most powerful country in Europe, the French monarchs had little control over their vassals, and many parts of France functioned as though they were independent states. The most powerful vassals of the French kings were the Plantagenet dynasty of England, who, through their Angevin ancestry, ruled large parts of western France. The ensuing conflicts, known as the Hundred Years War, helped to solidify the power of the French monarchs over their country. In France, the Valois dynasty came to the throne in 1328. Charles VII expelled the English and lowered the church's power under the state in 1422. Louis XI expanded the French state, laying the foundations for absolutism, in 1461. Edward IV began the restoration of royal authority, but the strengthening of the crown gained momentum only after the Tudor family came to power. Henry VII manipulated the Parliament to make it a tool of the king. He created the Royal court and the Star Chamber, in which royalty had the power to torture while questioning; this legal system allowed the king to limit the power of the aristocracy. He also promoted trade in order to gain the support of the middle class. His son, Henry VIII, took this process still further when, as a result of his desire to have a male heir, he founded the Anglican Church in England and broke away from the Catholic Church (this was also known as the reformation) After Henry married Catherine of Aragon, she failed to produce a male heir, and Henry desired to divorce her in order to marry a new lady, Anne Boleyn, who he hoped would be able to produce a son. The Catholic Church strictly prohibited divorce, however, and Henry found that the only way to sever his marriage was to separate from the Pope's jurisdiction. As a result, he withdrew England from the Catholic Church, establishing the Church of England, and in the First Act of Supremacy he established the monarch of England as the head of the Church. With the success of the Spanish reconquista, Spain expelled the Jews and Muslims. The marriage of Queen Isabella I of Castile and King Ferdinand II of Aragon, the Catholic monarchs (Spanish:Los Reyes Católicos), was the final element which unified Spain. They revived the Spanish Inquisition to remove the last of the Jews. In the Holy Roman Empire, which occupied Austria and Bohemia, the Hapsburg Dynasty began. The Empire expanded its territory, acquiring Burgundy and attempting to unite Germany. The emperor's son married the daughter of the Spanish monarchs Ferdinand and Isabella; their son, Charles V, became heir to Spain, Austria, and Burgundy. The Ottoman Turks were Muslims from Asia Minor who gradually conquered the old Byzantine Empire, completed in 1453 with the fall of Constantinople (renamed to Istanbul). New monarchs began to utilize the court during this time to increase their power by setting themselves apart from the lay people and by allowing the king to control the nobles. The court became the center of politics and religion in their respective nations. Nobles were required to live in the courts, and were as a result under constant watch by the king. Thus, the most important function of the court was that it allowed the king to control the nobles and prevent coup. In addition, however, the courts served an important social function, as the king's social circle was the nobles, and the court allowed him to interact with them. Court life was incredibly lavish, with events including hunting, mock battles, balls, parties, dances, celebratory dinners, gambling, and general socialization. The middle class loved this, and frequently copied the behaviors of the nobility from the courts. ↑ Kagan, Donalt et al. The Western Heritage Since 1300. 3rd ed. New Jersey:Pearson Prentice Hall, 2004.